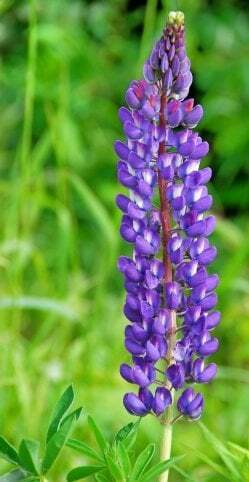 The Lupine flower (Lupinus) is a very differently shaped plant. The plant itself grows very tall and upright. They can grow to be anywhere from 3 to 5 feet tall! They grow upright along a very long stem. The flowers grow off of the stem and grow all along the stem from the bottom to the top. The Lupine flower resembles the shape of a rocket ship, getting ready for take off. Most are perennials, but some species are annuals. Before purchasing some seeds, or the plant itself, make sure you know what kind you want so that you buy the right type. The Lupine plant is a member of the pea family, so they can grow well planted near other vegetables. Lupines come in colors such as pink, purple, blue, yellow, and white. When planted in a whole group together, they look very neat. They really are a unique looking flower. There are over 200 different species of this plant. On certain species, you can eat the seeds. You can boil or roast them. Lupines grow best in the end of spring, through to the beginning of summer. They grow in many zones and are fairly easy to grow. First you want to make sure you plant them in an area with lots of sun. They grow best when placed in full view of the sun. Also make sure they are planted in soil that is rich in nutrients and very well drained. Plant them each about a foot or two apart. If you are using seeds, you want to bury them in about an eight of an inch of soil. Another unique thing about these flowers is their leaves. Well, at least I think it is unique! The leaves that accompany the flower look like little green flowers. The leaves are split into about 5 or 6 little leaflets, that circle each other and resemble a little green flower. They are very cute. If you ever get the chance to plant Lupines in your garden, do it! They will surely be the most widely talked about plant in your garden.